A prostrate summer annual that often forms dense mats that may reach 16 inches in diameter. All parts of the plant emit a milky sap when broken. Spotted spurge if found throughout the eastern half of the United States and also in California and Oregon. 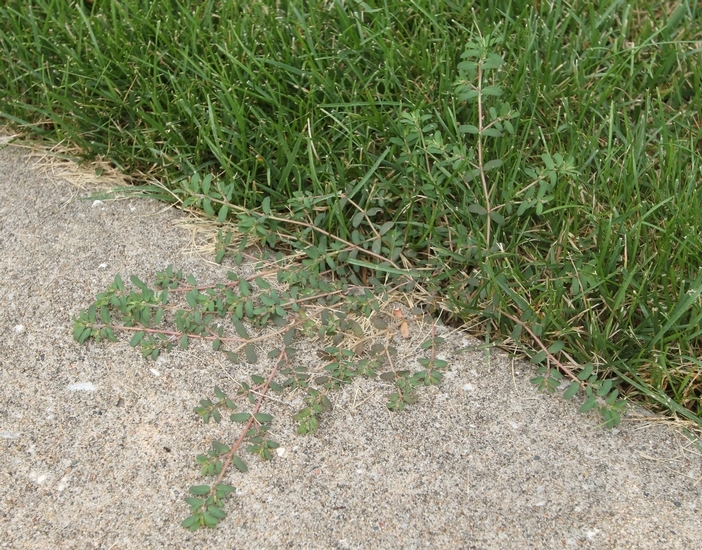 This plant primarily occurs as a weed of landscapes, nurseries, turfgrass, lawns, and some agronomic crops. 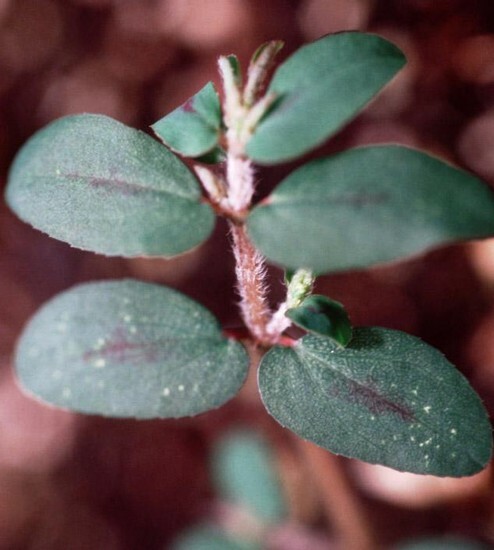 Cotyledons are without hairs (glabrous), oval, green above and tinted maroon below, and occur on short petioles that are maroon to purple in color. Stems below the cotyledons (hypocotyls) are also without hair and pink to maroon in color. Egg-shaped in outline, 4 to 15 mm long, and usually without hairs but sometimes long hairs may occur. Leaves are arranged oppositely along the stem and often have a maroon spot on the upper leaf surface. Leaves occur on very short petioles and leaf margins may be very finely toothed (often indistinguishable) near the leaf apex. Prostrate, branching out from a central point, densely hairy, and pink to red in color. 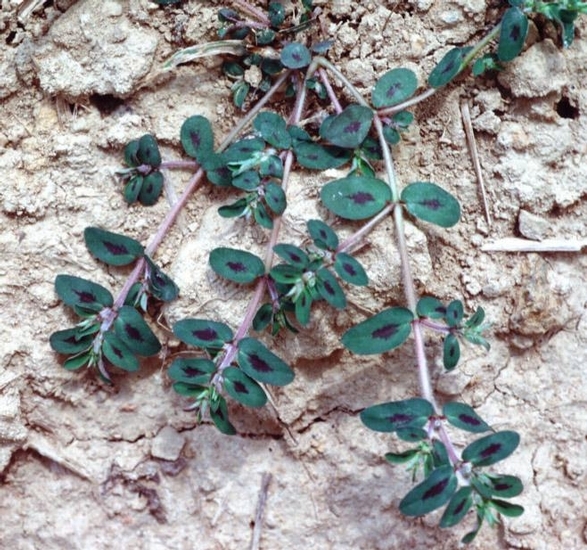 Spotted spurge stems do not root at the nodes. Arise from the positions between the leaves and stems (leaf axils). Flowers are relatively inconspicuous. A hairy capsule approximately 1 1/2 mm long. Small taproot and more noticeable fibrous root system. Small prostrate plants that emit a milky sap when broken and form dense mats that radiate out from a central point. 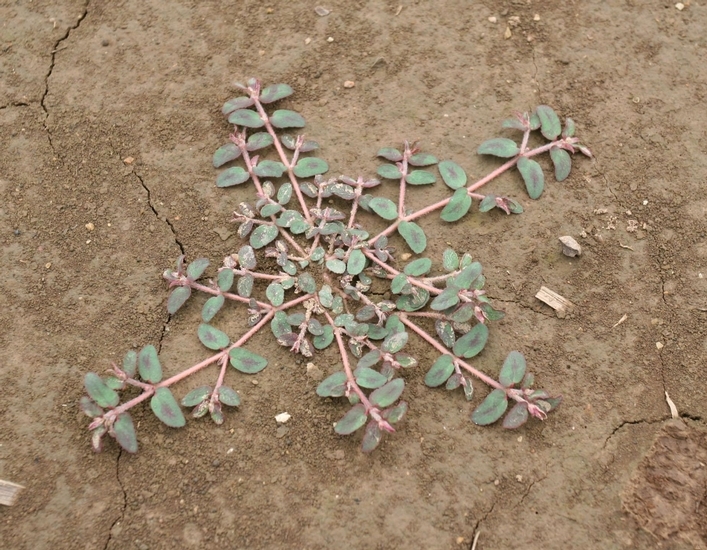 Spotted spurge is very similar in appearance to Prostrate Spurge (Euphorbia humistrata), however prostrate spurge roots at the nodes while spotted spurge does not. Prostrate Knotweed (Polygonum aviculare) also grows prostrate and forms dense mats that radiate out from a central point, however prostrate knotweed has an ochrea and also does not emit a milky sap like the spurges.